We're not sure if a boozing hall of fame exists, but if it does, it better make way for Peter Hill and John Drew. 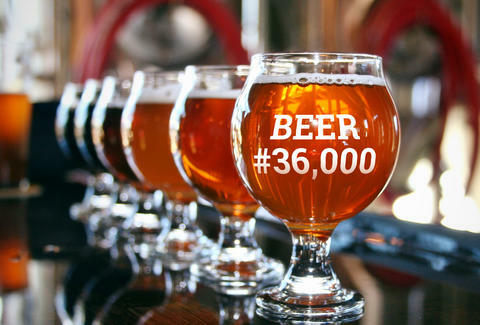 Just this week, the two Brits hit the 18,000th stop on a pub crawl they've been pursuing since 1984, which has racked up at least 36,000 pints, 150 boxes of memorabilia, and admiration from casual beer fans the world over. As Metro explains, Hill and Drew formed the Black Country Ale Tairsters group 30 years ago to shake up their usual pub routine. They vowed to try a new place every week, taking a photo at each stop to record the pub for posterity. In the ensuing three decades, their journey has taken them all over the UK -- just last year, they completed a seven-year quest to hit all 11,000 pubs in Wales, and collectively, they've added more than 250,000 miles to their cars. (Their mechanic is no doubt a very happy man.) While Hill and Drew are currently the last men standing, the group originally included 20 soldiers, all of whom fell out at various points, presumably citing concerns over "family commitments" and "rapidly expanding beer guts". A notable exception is Hill's Father Joe, who was proudly pub-crawling with his son until April, when he passed away. The guys have built up enough of a name for themselves that pubs consider a visit a coveted endorsement -- and the pair has leveraged this into a charitable effort, asking every pub they hit to donate £1 to a local children's hospital. If you happen to bump into the men on their next stop, make sure to raise your glass in respect. And maybe buy them a pint, because they're probably a little strapped for cash. Kristin Hunt is a Food/Drink staff writer for Thrillist. She did a pub crawl in London one time, but she only lasted for three stops. Follow her to inferiority complexes at @kristin_hunt.